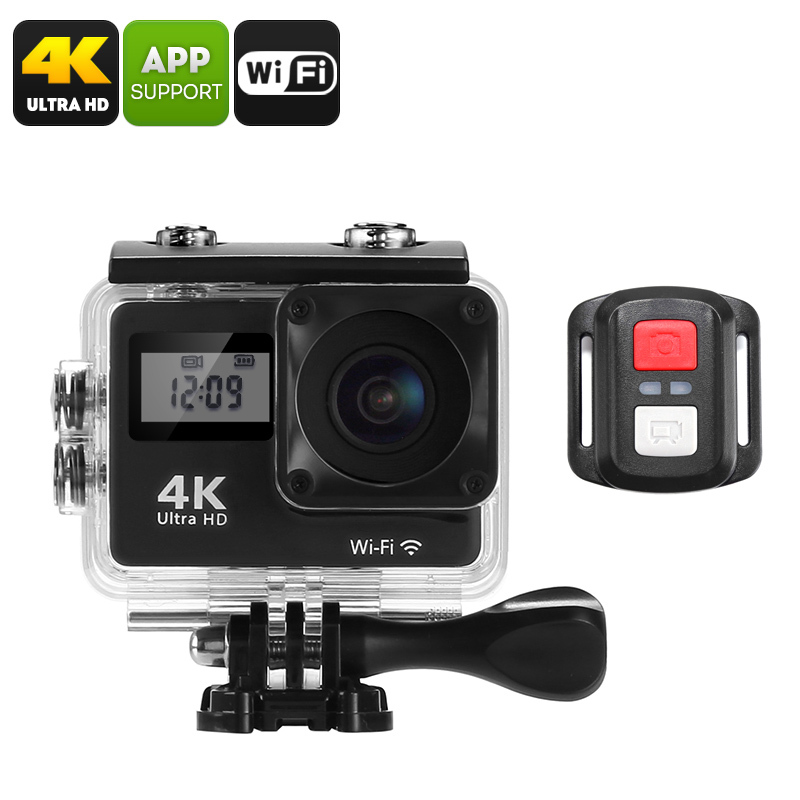 Successfully Added 4K Sports Action Camera - 170-Degree Lens, WiFi, 2 Inch Display, IP68 Waterproof Case, 12MP CMOS Sensor, App Support to your Shopping Cart. Capture stunning 4K video of all your upcoming holidays and outdoor adventures with this 4K sports action camera. Thanks to its 1/4-Inch 12MP CMOS sensor, this compact sports camera is capable of shooting breathtaking 4K footage and 12MP photographs at any time. Thanks to this, you can be guaranteed that not a single special moment ever again passes by uncaptured. Your sports camera comes with a durable IP68 waterproof shell. Therefore, you’ll be able to use it in the toughest of environments and even underwater. Whether you’re into mountain biking, skiing, or diving – this 4K action camera follows you anywhere you go. By packing a 170-degree wide-angle lens, your sports camera captures all that’s happening in front of you. You will be able to shoot stunning footage and make sure your action cam won’t miss out on even the slightest of details. Different shootings modes, time lapse, and slow motion recording offer a wide-range of recording possibilities. Thanks to this, your sports camera is sure to meet your media demands. It furthermore supports different exposure levels and white balance. This guarantees that you’ll always be treated with clear and sharp images that look absolutely breathtaking from a visual perspective. This unique sports action camera comes with 2 LCD displays. At the front, it features a small black and white display on which it constantly keeps you up to date on the time and battery life. At the rear, you’ll be able to find the standard 2 Inch touch screen. This display lets you watch back your previous recording instantly to make sure all your footage looks the way it should. With its 32GB SD card support, your 4K action camera offers plenty of storage for all your previously shot footage. These videos can either be modified later on your PC or shared instantly onto your iOS or Android smartphone thanks to its WiFi support. By packing a 1050mAh battery, it allows you to record for up to 1.5 hours in a row. This 4K action camera comes with a 12 months warranty, brought to you by the leader in electronic devices as well as wholesale electronic gadgets..